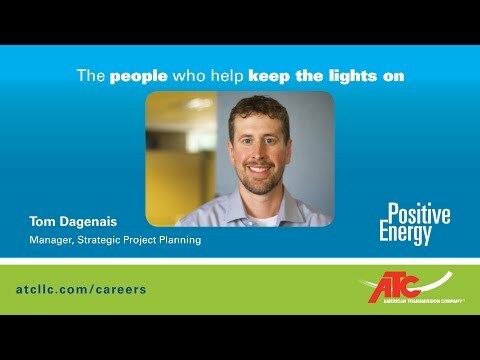 The people who help keep the lights on: Tom Dagenais, Manager, Strategic Project Planning | American Transmission Co.
Tom Dagenais, manager, strategic project planning, develops solutions for the future of the electric transmission grid within American Transmission Co.’s service area. He says ATC is the perfect fit for him because he knows what he does makes a difference. Beyond powering communities, Dagenais says he appreciates that ATC is as invested in his community as he is. “ATC really has a strong community involvement. I think that’s a source of pride for the people who work here – that ATC does try to give back to the community and is very active in doing so. It’s just nice to be part of an organization that cares,” Dagenais said. Dagenais has been with ATC for nearly 14 years total. In that time, he has grown from an individual contributor to a leader. He says he chose ATC twice, once in 2004 and again in 2010 after a brief departure to work in consulting, because of the growth opportunities offered. Now in a leadership role, he works to make sure newer engineers on his team have opportunities to learn, challenge themselves and expand their perspectives. At the same time, he encourages his team to embrace work-life balance. Dagenais says he believes ATC is an ideal landing place, especially for newer engineers. If you are interested in joining Dagenais and being part of the ATC team, browse our open positions.